The cheeses of P.D.O. 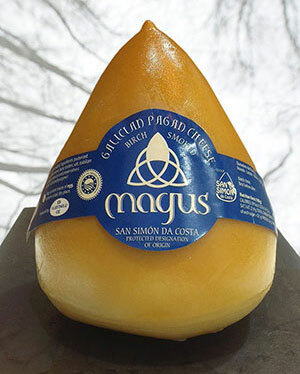 San Simón da Costa are made with pasteurized cow’s milk, without calostros or preservatives, from the native breeds (Galician blonde, Alpine-brown, Frisian and their crosses), within their specific geographic range. The small one or “bufón”, matured for at least 30 day. The “bufón” weighs between 0.4 and 0.8 Kg and measures between 10 and 13 cm in height. At the end of the maturation period it will be smoked, for which birch wood is used. This wood is used since in the town of San Simón da Costa it was an area where wooden clogs, birch wood were produced, and the surplus chips from the manufacture of clogs were what used to be smoked cheese, A tradition that continues to this day. The P.D.O. San Simón da Costa Cheese In shape, it is somewhat between a wooden top and a bullet, the upper part being pointed. The rind is smoked, hard, and rigid, between 1 and 3 mm thick, ochre-yellow in colour, and somewhat greasy to the touch. The body is of fine texture, fatty, quite hard and yet elastic, between white and yellow in colour, easy to cut and of characteristic flavour and aroma. Its fat content on dry stratum will be more than 45% and less than 60%. Coagulation: The coagulation of the milk will be provoked with rennet. The lactic ferments used are lactococcus lactis, in their different varieties, streptococus cremoris and streptococus lactis. The precise doses are used so that the coagulation takes place in a minimum time of 30 minutes and maximum of 40 minutes, maintaining the temperature during the coagulation between 31 ºC and 33 ºC. Cutting: The cuttings will be made necessary so that the granulometry of the curd is of the size of grains of between 5 and 12 mm of diameter. Molding: It will be made in molds of suitable shapes and dimensions to obtain cheeses with the characteristics of the certified product. Pressing: It will be carried out in suitable presses, remaining in them for the necessary time, for a minimum of 3 hours, depending on the pressure applied to it and the size of the pieces. 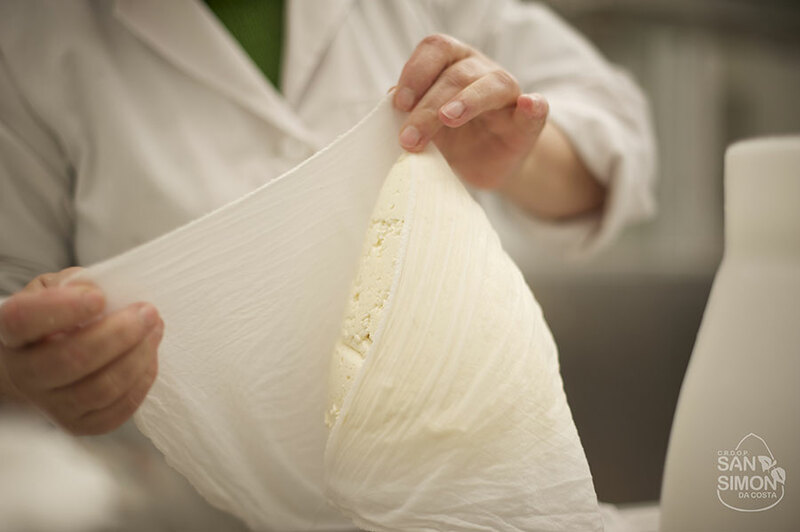 To facilitate the elimination of the serum and the smoothing of the crust the cheeses will be wrapped in cloths of cotton. Salting: it will be made in brine with a concentration between 14 and 17%, with a maximum immersion time of 24 hours. Maturation: The minimum period will be 45 days for the large format, and 30 days for the small format (Jester), counted from the end of salting. 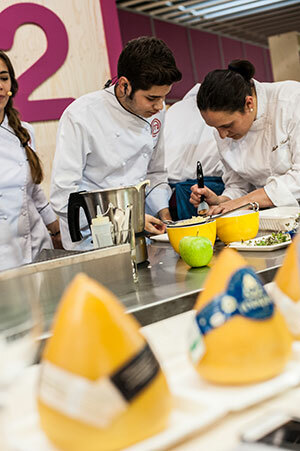 During the maturation time the cheeses will be subjected to the turning and cleaning practices necessary to acquire their peculiar characteristics. Smoked: The necessary time will be used until reaching the characteristic color, avoiding, in any case, the close contact with the fire. It will always be made using birch wood, without bark. 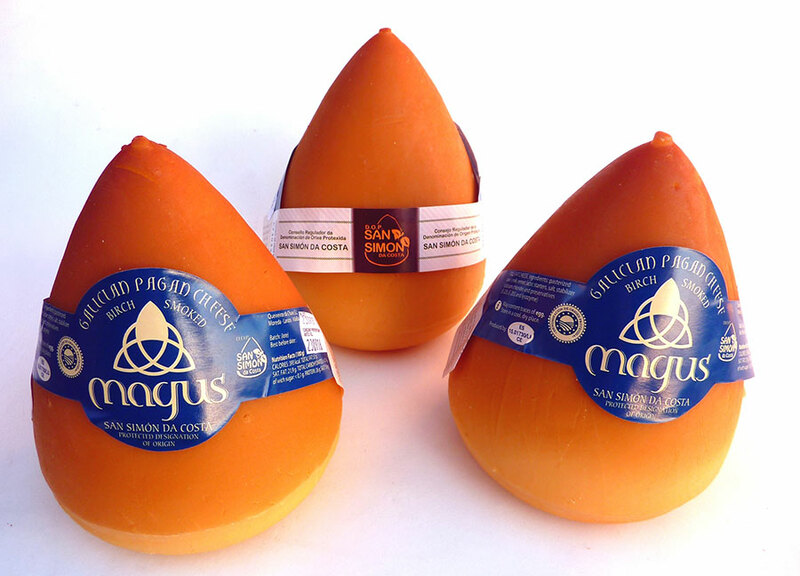 The pieces are marketed with a MAGUS label, and a numbered and controlled counter-label where reference is made to the Protected Designation of Origin, which guarantees the origin and quality of the product. 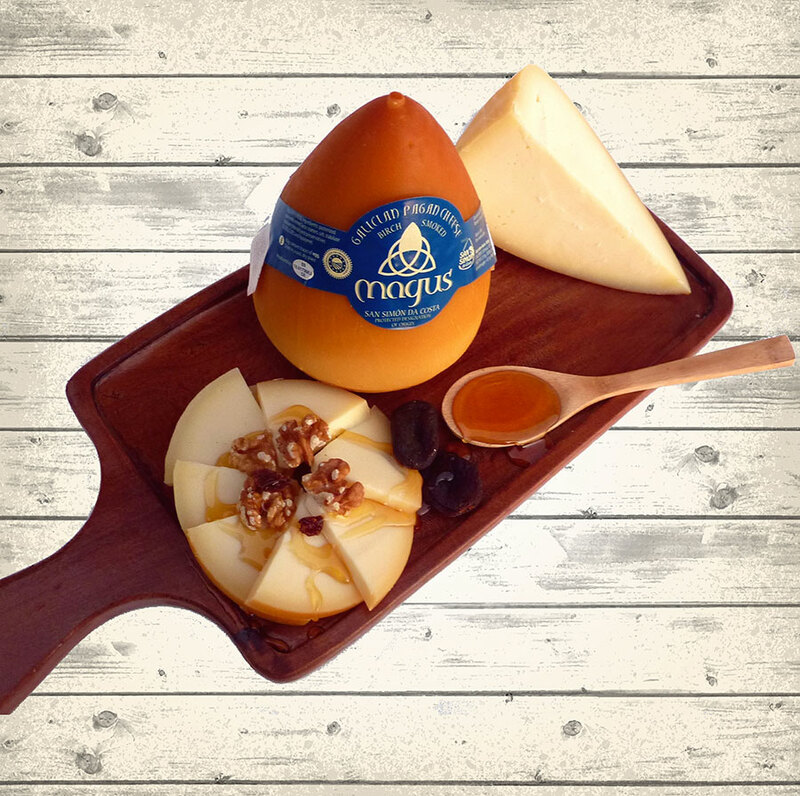 The area of production, both milk and cheese, covers the region of Terra Chá; Land of great milky tradition of the province of Lugo Galicia, which includes the following municipalities: Abadín, A Pastoriza, Begonte, Castro de Rei, Cospeito, Guitiriz, Muras, Vilalba and Xermade. This area of cheese production is characterized by the presence of fertile interior valleys protected by mountainous systems, in which the abundance of meadows and pastures stands out, to the point that they are a fundamental element of their landscape. It is also a natural environment where the birch abounds, whose wood, used in the smoking process, provides the product with an unmistakable color and aroma. The small family farms that are characteristic of the DO, in which the herd grazing traditions are followed, and in which the feed is mainly based on fodder, in a favorable geographical environment for the growth of abundant meadows, it make that the milk has peculiar conditions and of great quality for the elaboration of cheeses. It is scientifically proven that these systems of production and feeding of the cows in a more natural way give to milk an improvement in its nutritional quality, due to the greater accumulation of CLA (conjugated linoleic acid) and Omega-3 Fatty Acids in its Lipid profile, since as the animals consume more pastures, the content of these fats increases, which also affects the characteristics of the elaborated cheeses. Reduces chronic diseases: It is rich in conjugated linoleic acid (CLA) and sphingolipids, components of fat milk that help reduce the risk of cancer and heart disease. Improve your cardiovascular and reproductive system: fatty acids such as linolenic (Omega-3) and linoleic (Omega-6) are essential for growth and beneficial for cardiovascular, reproductive, immune and nervous systems. Promotes cell growth: Thanks to its vitamins A and D helps improve vision and immune system. Essential Minerals: The calcium and phosphorus it brings contribute to the growth and strength of bones and teeth. It is important to consume dairy products throughout your life to maintain good bone density and prevent osteoporosis. Valid for lactose intolerant: They do not contain substantial amounts of this enzyme, so that all people can consume it without problems.